Americans celebrate Thanksgiving later this week, about a month and a half after Canadians mark their own similar holiday. A trip last week to the picturesque City Market in the heart of downtown Saint John, New Brunswick — filled as it is with vibrant colors, numerous tastes and smells, all manner of local and regional food offerings and friendly vendors — brought to mind both country’s annual Fall celebrations. These images taken during that trip provide a small sampling of this wonderful local marketplace. Hi Brett! Would you mind if we used some of these photos on the City Markets Social Media Accounts? Hi, Melissa, thanks for asking and please feel free to do so. The Market is a wonderful place! Saint John, New Brunswick is ALWAYS spelled out, never abbreviated. It’s not St. John. It’s Saint John. Brian, I corrected that — thanks for letting me know! It brings back memories! I loved dulse. Definitely a distinctive regional food. Beautiful! Maybe if I take pictures at the grocery store I’ll get motivated to shop and cook? All that good food is very tempting! This pictures now make me want to visit Granville Island Market. I’ve not visited that one myself but all such local markets add special character to an area. 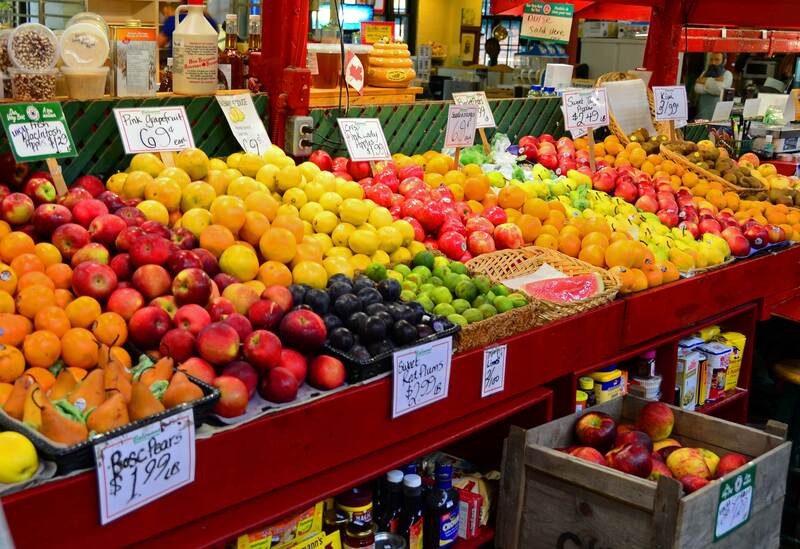 I love photos like these –the markets are so interesting and the displays are just eye candy! Spelling lesson about Canadian place names: the city in New Brunswick is ALWAYS spelled Saint John with the Saint spelled out in full. The capital city of Newfoundland and Labrador is St. John’s (with an apostrophe and an ‘s’) There is also a Fort St. John in northern British Columbia. Thanks! I had seen it both ways and at least avoided the apostrophe “s” that accompanies St. John’s, Newfoundland. Brian from an earlier comment pointed that out as well. Should be correct now. And you are right, the Saint John city market, one of the oldest in Canada, is a treasure and a lovely place to a visit. Your pictures do it justice. Thanks. Right in the heart of the city. Have been there frequently when I lived in New Brunswick. Try the Saturday Fredericton market as well. Hendrik, thanks for the suggestion of the Fredericton market. Pictures are so excellent I am now starving. You’ve gotta love the Saint John Market, one of eastern Canada’s finest. Next time head to Fredericton! Thanks! Definitely need to check out the Fredericton Market as well! My hometown! And home of the oldest market in Canada. Did you know the ceiling of the market was constructed to look like the ribs of a ship? So pleased to have found your blog Brett. Ali, thanks for these additional details about the City Market. I had not noticed that about the ceiling — very cool and will be on the lookout on my next visit! Colorful and delicious but I must make food run!